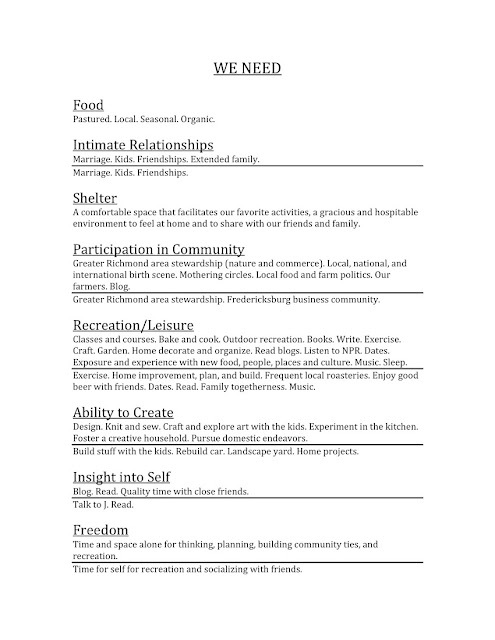 In the same spirit as our Family Mission Statement and Family Rules, I want to share an exercise that we completed to redefine our basic needs. Perhaps like many of you on the journey to your best life I've been striving to "simplify". To do away with the clutter that threatens clarity and that steals my time and energy. Whether the clutter is literal stuff filling up the space that we live in and work, empty or superficial relationships, processed and factory farmed foods, or busy routines that leave us exhausted and wanting. We aim to experience more of the good stuff in life and pursue as priorities only that which brings more joy and meaning to every day. One step to gaining clarity is to distinguish our needs from our wants. When asked to define my basic needs, I had only ever considered the literal basics of food, shelter, and water, which wasn't very inspiring. Of course we need those, and we have them. So what now? Andrea from Frugally Sustainable wrote a blog post Redefining our Wants Versus our Needs as part of the 23 Day Frugal Living Challenge series that she created. In the post she paraphrases Donella Meadows from her book Beyond the Limits, and shares examples of how we might reframe what we really need. You don’t need a bigger house or car, you need respect. You don’t need the newest cosmetics, you need to feel attractive. You don’t need a closet full of clothes, your need variety and beauty. You don’t need electronics (i.e. TV’s, gaming systems, stuff with apple logos, etc. ), you need something worthwhile to do with your life. You don't need material things, you need identity, community, challenge, acknowledgement, love, and joy. I considered these nine basic human needs and wondered how the list might translate to my own life. What would it look like for Andy? 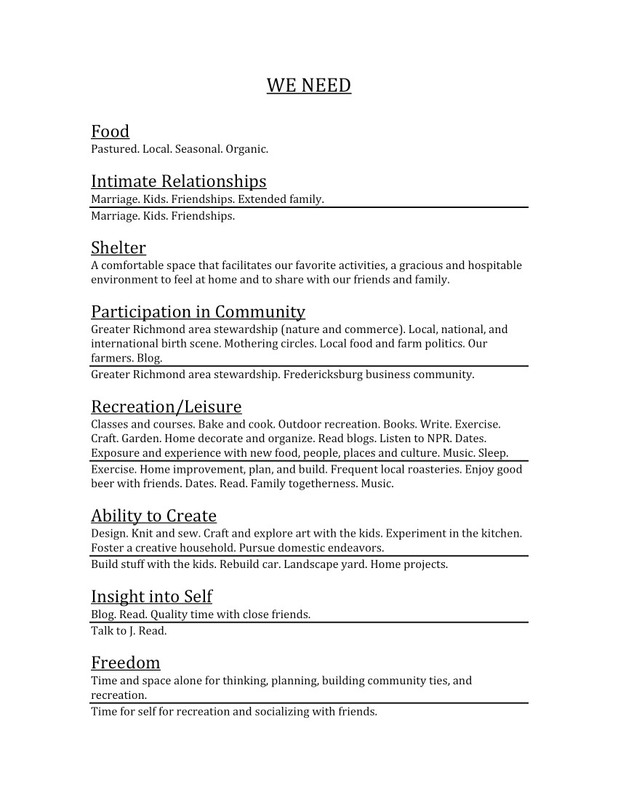 We spent some time expanding each category to encompass our values and interests. I focused especially on the Intimate Relationships category and defined in detail, by name, the individuals that I want to comprise my tribe. I omitted the full list here, but paring down my social connections was necessary and the result is that the small amount of time that I have to share with others is directed at those relationships that I really care to invest in. Simple, right? Obvious, maybe. What I love about our list though, is that the 9 basic human needs serve as a compass when we're given an opportunity to make an investment of time or money. These items we identified are what bring authentic happiness to our lives. These are the elements that are truly worth spending our money on. It helps us to know how best to allocate our time. And it really does work. How would you redefine your 9 Basic Needs? Ultimately, I want to live a compassionate life- one that produces the ability to pay it forward. The biggest challenge I face is how not to sacrifice my nine basic needs and yet somehow make other's needs as equal to or higher than my own, also known as MOTHERING. Quickly, in terms of getting rid of actual physical stuff I am really embracing a less materialistic more frugal/ meaningful acquisition of belongings lifestyle. I know I've hit the danger zone when I've allowed my baby to be effected by so much commercialism that she actualy picks through the weekends store flyers and shows me what she wants. AT not yet 3!!!!! "Mama I want these chocolate bunnies and this makeup for easter, ok?" What a wake up call! My daughter is acutely aware of her stuff and getting/buying more. My biggest challenge ahead is the research and application of how to stop the consumer trend in me and in my home.